From left Talei Lange, British Deputy High Commissioner Dave Jones,Fiji Paralympic Committee President Shaenaz Voss,Fiji National Sports Commission Excutive Chairman Peter Mazey,Senior Paralympics Development Officer Albert Miller with para-atheletes Iosefo Rakesa and Ruci Senikula after the round table meeting at the British High Commissioners residence Suva on February 8,2019.Photo:Simione Haravanua. 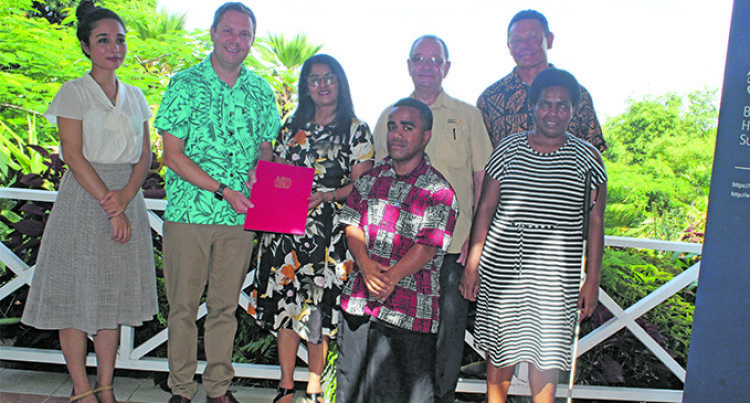 The British Government has given Fiji’s Paralympics Committee a major boost ahead of the Tokyo 2020 Paralympic Games, with the announcement of $25,000 in funding. The funding will mainly help the commit­tee identify top para-athletes through stake­holder engagement, talent identification and inclusion workshops. The announcement was made by Britain’s deputy High Commissioner to Fiji, Dave Jones, at Gordon House, Suva yesterday. “Sporting bodies that will benefit from this funding are swimming, table tennis, badmin­ton, archery and athletics,” Jones said. “The momentum is definitely building, and we are excited about the next 18 months,” the Fiji Link executive general manager and Fiji Airways Group head of corporate, interna­tional and Government affairs said. “Like our other sponsors, the British High Commission have shown that they are avid supporters of Fijian Paralympians. The committee will also focus on improving societal attitude towards the disabled through a more inclusive sporting environment. This is also in line with Fiji National Sports Commission’s goals, says executive chairman Peter Mazey. “An inclusive sports environment is some­thing we are trying really hard to build,” Mazey said. “The para-athletes are also ambassadors of what’s happening on the ground in terms of Non-Communicable Diseases (NCDs). Iliesa Delana won the high-jump event at the 2012 London Paralympic Games to become Fiji’s first gold medallist at a major interna­tional paralympics competition. But the committee has major plans to ‘un­cover and nurture talent for international competition,’ with the aim of winning more medals. Para-athlete, Iosefo Rakesa, who is aiming to participate in javelin and shot-put events at the Tokyo Games, believes the funding has come at a crucial time. Rakesa is eager to represent Fiji at the Games and will be working hard to achieve his goals.